Is Mary's Arm Pain Caused by Bad Shoes? My mother recently picked up a couple of new chairs. Since I want to have someplace I enjoy sitting when I visit her I needed to do some light chair remodeling. Keep in mind that the best way to sit is with your hips slightly higher than your knees. Very seldom do I find any chair that puts me in this position and I have never found a casual chair that does - without changing it a bit. 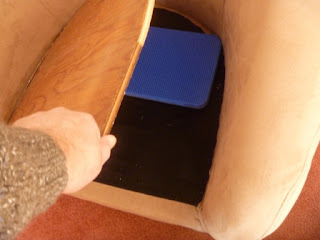 Step 1: use the seat cushion as a template to draw it's shape on a piece of plywood. Step 2: cut the plywood about 1/2" inside the template drawing where the sides and back of the cushion are. At the front of the cushion, I took several inches off of the plywood because this would have hit the front edge frame and made the front too high. Step 3: Place something of about the right height underneath the back of the plywood. Here I used a foam pad that's used for kneeling on when gardening. This has worked out to be a good height on several of the chairs I have done this to. Once you put the cushion back on you could never tell by looking at the chair that anything is different about it. But what a difference it makes in your body. When you have the height just right then your back doesn't have any stress on it. You can sit there for a long time and then get up easily from the chair. You hardly notice you are sitting at all. Click here to see how to fix car seats. Thanks for this amazing guidance which help me a lot. 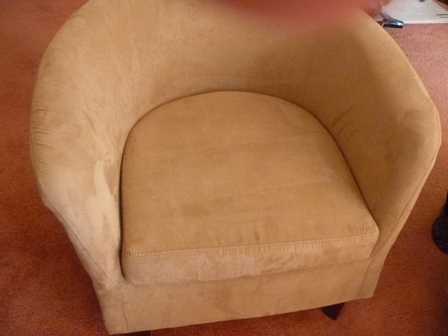 If you want to get further detail on Office chairs Maroochydore , visit Danny's Desks and Chairs.